Howlin' Wolf Records: SIX STRINGS: OLIVIER DERIVIERE SCORES "REMEMBER ME"
Paris, France (April 22, 2013) - Classically trained multimedia composer Olivier Deriviere (Alone In The Dark, Of Orcs And Men), whose distinctive soundtracks have been recognized by Billboard and The New York Times, has crafted a unique, electronically manipulated live symphonic score for the upcoming action adventure video game Remember Me developed by Dontnod Entertainment and published by Capcom. Deriviere's dynamic emotional score is intricately woven throughout Remember Me's innovative 'memory remix' game-play experience and immersive futurist story set in Neo-Paris where personal memories are digitized, bought, sold and traded. Remember Me will launch on PlayStation 3, Xbox 360 and PC in North America on June 4 and across Europe on June 7, 2013. Remember Me is a 3rd person action adventure where players take on the role of Nilin, a former elite memory hunter with the ability to break into people's minds and steal or even alter their memories. The authorities, fearful of her knowledge and capabilities have arrested Nilin and wiped her memory clean. After her escape from prison, Nilin sets out on a mission to recover her identity, helped by her last and only friend. This search for her past leads to her being hunted by the very people that created this surveillance society. During the course of the story, Nilin will start remembering who she was and re-learning all the fighting moves that made her one of the world's leading memory hunters. 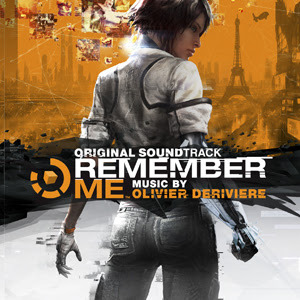 Olivier Deriviere's interactive musical score for Remember Me features live orchestra that has been digitally processed and manipulated with multiple layers and effects to create a futuristic - but entirely organic and acoustic - musical palette which reflects Nilin's memory loss and the reconstruction of her memories throughout the game. Described by critics as "Cinematic and magnificent" (GameTrailers), "Fantastic and evocative" (IGN) and "One of the best soundtracks...this generation" (Destructoid), Deriviere's score dynamically reacts to the player's moves during gameplay and contains hidden messages about the story. Preview samples of the music are available on SoundCloud. The score was recorded with the Philharmonia Orchestra at Air Studios in London by GRAMMY® award-winning score engineer John Kurlander and mastered at Universal Mastering Studios in Los Angeles. Olivier Deriviere has previously scored numerous animation, film and video game soundtracks including the critically acclaimed interactive scores for Alone In The Dark, Of Orcs and Men and the Obscure video game series. Deriviere works with renowned recording studios, world-class engineers and performers, as well as employing the latest software and custom library sounds. An alumnus of Berklee College of Music (Jazz & Film Scoring) and the National Conservatory in Nice, France (Composition and Orchestration), Deriviere has recorded for games with the GRAMMY® award-winning choir The Mystery of Bulgarian Voices, The Boston Cello Quartet, The Boston String Quartet, The Children Choir of the National Opera of Paris and The Philharmonia Orchestra in London. His music has also been performed by the Cannes Symphony Orchestra, Monte Carlo String Quartet, and Utrecht Metropolitan Orchestra and Choir ("Games In Concert"). For more information on Olivier Deriviere, visit www.olivierderiviere.com. For more information on Remember Me, visit www.facebook.com/Remembermegame. 5/5 How did I miss this, I cannot believe how cool this score is... I remember reading about it, joining the Facebook page and then... it is here. I completetly enjoy how Olivier Deriviere brings this score to the table, if you don't trust me go listen to the samples... this score is: Available on iTunes, Amazon mp3, Spotify, Xbox Music and more.